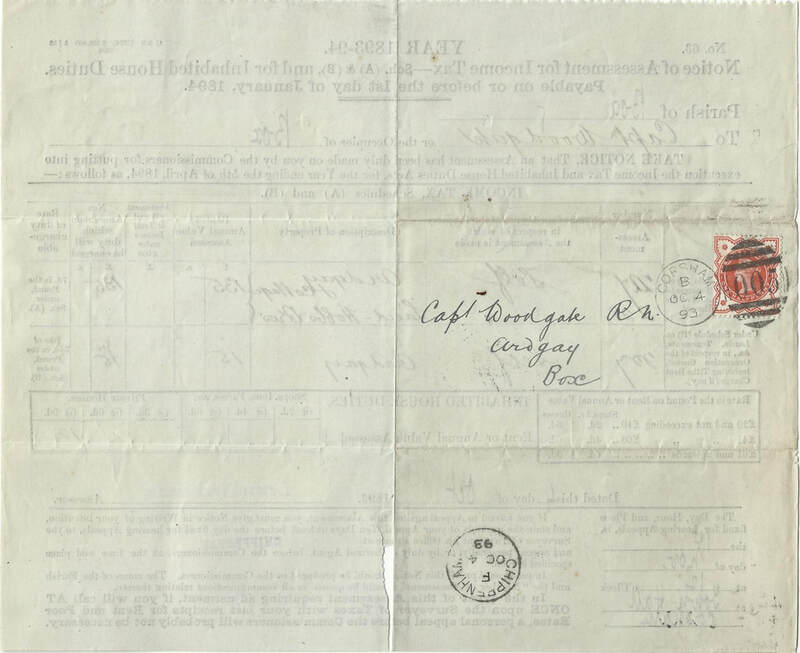 The pictures above (courtesy Eddie Weeks) are of correspondence between the Inland Revenue and Captain Woodgate relating to his Schedule A Tax demand for Ardgay and Ardgay Cottage and land in 1893. Modern income tax in Britain started in 1803, although a temporary tax had started in 1799 to pay for the wars against Napoleon. Income was divided into five diferent schedules including Schedule A (income from land and buildings) and Schedule B (income on farming land). It lapsed for many decades but was reintroduced in 1842 by Prime Minister Robert Peel as part of a general reform of taxation including the Repeal of the Corn Laws and the reduction of hundreds of import duties. Despite many promises to abolish the tax in the 1870s, income tax stayed because it was very efficient at raising revenue at a rate often of 10% for those earning over £150 per annum. 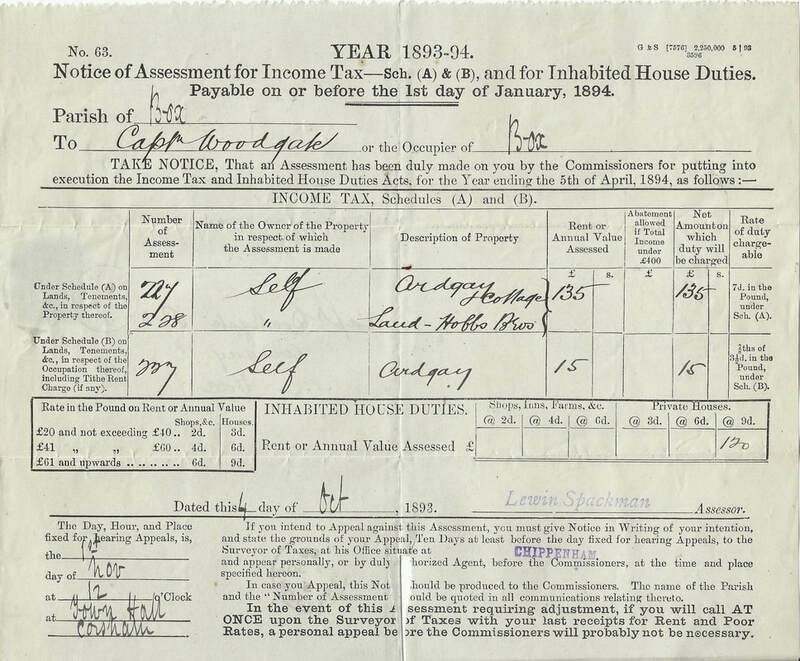 Captain Woodgate was letting out the cottage on his estate to Laud-Hobbs Bros (unknown) and receiving an annual rent estimated by the commissioners as £135 a year on which he was liable for tax of about 3% (7d in the £). On the field he let out for £15 a year he was liable for tax of about 1% (⅞ of 3½d in the £). And on Ardgay, his private house, he was assessed to rates of about 3¾% (9d in £). For much of the Victorian period, taxation was to pay for wars and conquest rather than for civil or social responsibilities. The 1880s was a time of great imperial expansion: Egypt became a British Colony in 1882, Burma in 1885, Kenya in 1886 and Zululand was annexed in 1887. We don't know if Captain Woodgate appealed against the assessment of 1893-94 but, as a military man, he presumably supported the financing of such a rapid imperial development.